Please print the order form below, fill out completely, and mail with your check or purchase order for us to begin production. Please make sure you have received a current shipping/freight quote and have included it on the order form. (See the bottom the the order form page for quote requests and shipping information.) We accept purchase orders from YMCA's, Boys/Girls Clubs, High Schools and Colleges only. If you do not have a purchase order we request a materials deposit (half the total cost) before we can begin production. We will mail a snapshot of the board when it is completed along with a bill for the remaining balance. The board will be shipped when we receive the rest of the balance. 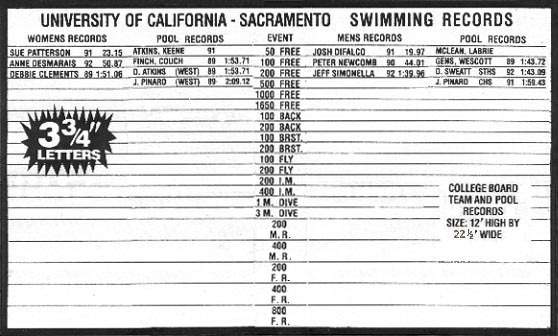 The center event column letters + numbers (200 M.R., 200 Free, etc.) are pulled from the total number of characters you get with your board unless you order the optional "contrasting color" center event column. 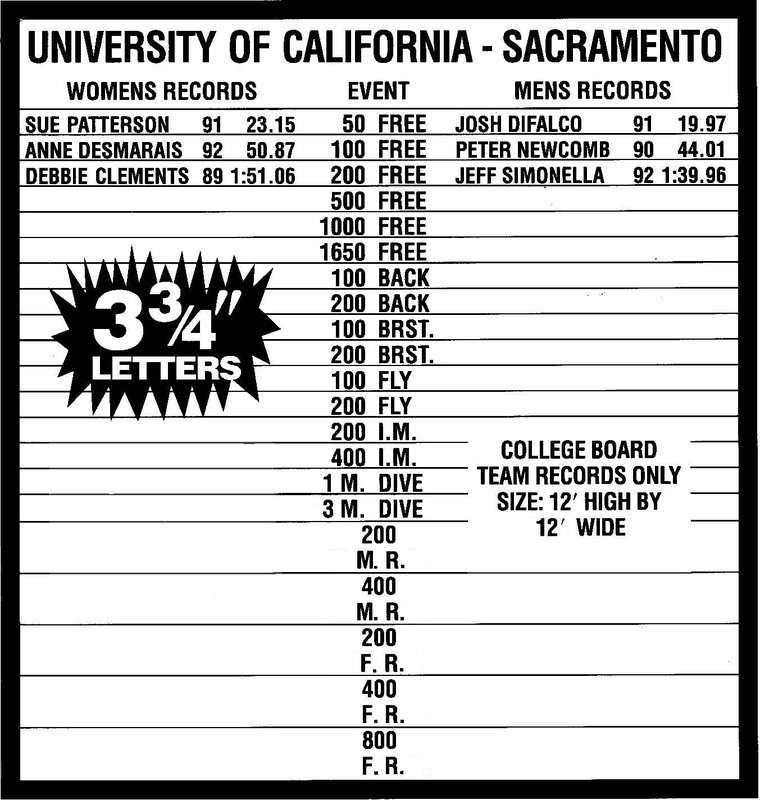 See the description next to each board on the HS/College home page for the number of characters that come with each board and the bottom of this order page for the % breakdown of individual letters and numbers. All boards are securely packed and crated with 2x4's and plywood. They are shipped, insured, via overland freight due to their weight and size. Larger boards are broken down into shippable sizes such as 4'x5' or 4'x8'. All un-assembled shipments will fit in the back of a pickup truck and through pool doors. Deliveries via overland freight (18-wheelers) are different than UPS shipments. By completing this order form you are stating that you have read and understand the letter breakdown and shipping information printed below the last section of this order form. Thank you for your business ! Please CIRCLE the choices and fill in the cost in the right column. No charge if one of our 27 standard colors. What do you want your major heading (large letters) across the top to read? .... Print below. 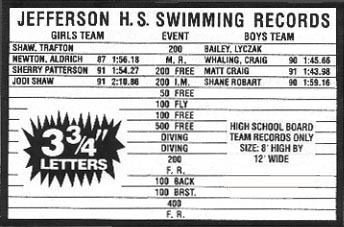 Option: The sub-headings ("Girls Team Records, Boys Pool Records, Mens Team", etc.) are attached using the letters that come with your board. If you want these in a contrasting color the cost is 50 cents each. If choosing this option, write your chosen headings in the space directly below and total the cost in the right column. Individual costs below. If ordering more than 100, you may take 15% off the price. If ordering over 150 you may take off 20%. Be sure to add mailing costs ... see below. How many letters and numbers do I get ? 3 ¾" Look at the total number of each you get with the board you pick. Out of each 100 letters you get 6 each of A, E, I, O, R, S, T ..... 5 each of C, L, N .......3 each of all the rest except X, Q, and Z (1 each) You can calculate how many of each number by the following: Of the total number, 13% are Ø's --- 11% are 1's, 2's, and 5's --- and 9% are 3's, 4's,6's, 7's, 8's, and 9's. 1 ¾" Look at the total number of each you get with the board you pick. Out of each 100 letters you get 8 each of E and I ..... 6 each of A ..... 5 each of O, L .......4 each of B, C, D, F, G, H, J, K, N, P, R, S, T, U ..... 3 each of M, Y ..... 2 each of V, and 1 each of Q, W, X, Z You can calculate how many of each number by the following: Of the total number, 12% are Ø, 1, and 2 --- 9% are 3, 4, 5, 6, 7, 8, and 9. A black Sharpie® can be used to turn an "F" into an "E"
Scrape the "stems" off the "Q" 's with a razor blade to use as an "0"
Shipping information: Quotes are based on shipment to a business address with individuals who can sign for the freight between the hours of 8 am and 5pm. Shipments to a residence, even if a business is located there, must be requested in advance and will incur additional cost. High schools, colleges or pool facilities should have a loading dock or a clearly marked space for deliveries from an 18-wheel truck. If they do not, they will be charged at a slightly higher "non-commercial" rate. The shipping cost only covers delivery to the front door of your facility. There may be additional cost if there is no one available to inspect and then sign for the board (he will come back the next day and you will incur a 're-delivery' charge). There will be an additional charge if the driver has to unload and hand-carry the board a long distance without assistance. Like UPS or FedEx, they do not give a time-window when they will deliver. You may request "Notification Prior to Delivery" but this carries an additional charge. The model of the board you are intersted in. Your address, daytime phone and an alternate phone (cell or home) with the best times to call. A fax number or e-mail if you want a hard-copy of the quote. We do not charge any packing or handling fees. The quote you get is what we actually pay the shipper. Notice about damaged shipments: Our boards are packed extremely well and rarely get damaged in shipping, but it can happen. Motivational Concepts will always pay for replacement and re-shipping of any damaged freight as long as the following conditions are met. Any damage (marks, scrapes, dents, crunched corners, ripped cardboard, indented plywood, etc.) must be marked on the delivery receipt by the person signing for the freight. Tell anyone who may sign for it to not be rushed by the delivery driver who has other deliveries to make. It only takes a few seconds to look over the freight and see if anything looks less than perfect. If not, just say .."It's probably OK inside but could you please note that there was an indent in the plywood of the big box and a rip in the cardboard of the smaller box?" The drivers do not mind doing this. It is not necessary to open the packages. Everything is probably fine but you want to be safe. If these notes are made, and "concealed damage" is found, you are covered 100% and we will ship out replacement items immediately. If not, you are responsible for 50% of the replacement cost and shipping. The freight company will not pay us a claim unless damage notes were made. It is not our responsiblity if a temporary office assistant or a janitor signs for something without checking for damage. If the board will not be mounted for a while, please open the sides of each box to check for concealed damage within 10 days of arrival. There is a 30 day limit to make claims on damaged goods. If damage is found, you must save all packing wood and carboard for the claims inspector to see. With all that said, only one in 25 items we ship by freight will end up damaged. But you do not want that 25th item to be yours.